Happy Holidays, Place to Be Nation! As our parting gift of the 2016 Major League Baseball season, now that all of the games have been played and the seemingly endless line of trophies and awards have been handed out, it’s time to look back one final time. Back in March, our Sports Evolution crew of Scott, Dr. G., Cowboy Sr., and myself took a shot at pre-season predictions. 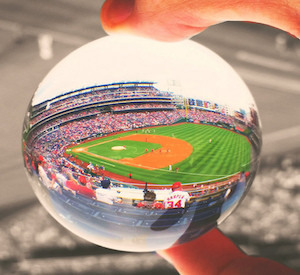 Well, there is nothing more impossible than baseball predictions. With the game being so intricate and luck-based, the game of prognostication is a humbling one, for sure. Join us to look back at our 2016 MLB Predictions as we put this season to bed. Analysis: Well, while no one had the Dodgers figured for pushovers, the G-Men had a rotten second half, which sunk our presumptive division favorites. However, they still made the playoffs, and may have knocked off the Cubbies in the NLDS if Bruce Bochy hadn’t over-managed his bullpen to death in Game 4. 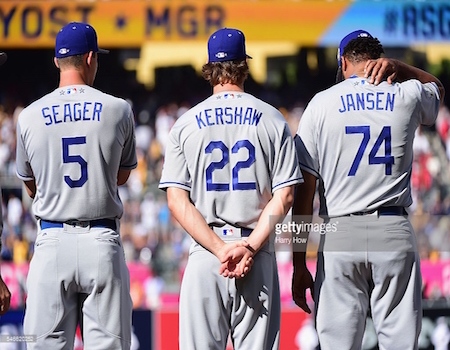 Corey Seager, Clayton Kershaw, and Kenley Jansen all played huge roles in getting LA to its fourth straight NL West crown. Analysis: So far, so dull. Yep, we ran the table with Chicago here too, but so did every sane analyst on the planet. 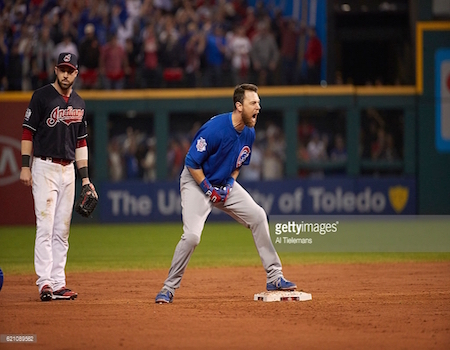 Ben Zobrist and the Chicago Cubs won it all in 2016, erasing 108 years of futility. Analysis: Overestimation of the Mets’ pitching staff, plus underestimation of just how good Washington would be (or perhaps, overlooking the Nats due to a bad 2015) led us to unanimously pick the Metropolitans here. As often happens with pre-season picking, injuries are near-impossible to predict, and we frequently make picks with rose-tinted glasses on. C’est la vie. 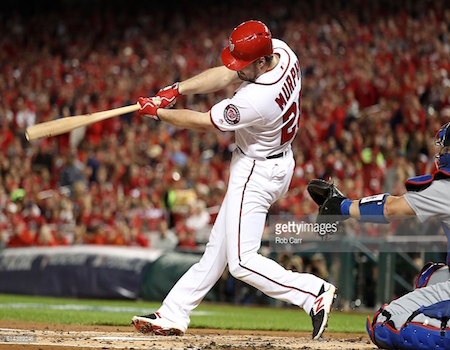 Free agent addition Daniel Murphy was really, really good for NL East champs in Washington. Analysis: Despite a few misses here, the panel was still close, as the Cardinals and Pirates were both in the playoff picture well into September. Heck, the Cards finished just one game out. 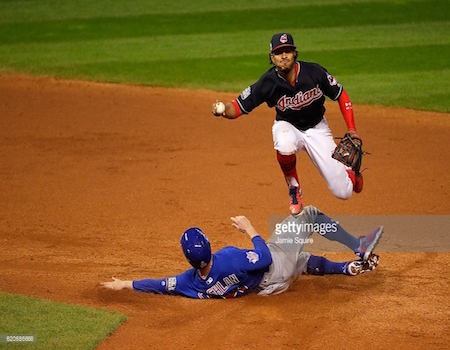 Overall, the National League was a lot neater than the American, which was like trying to predict the future. Or something. Analysis: If not for a wretched April (7-17), Houston probably gets a wild card berth or better and shakes things up a bit. As it was, with all of the injuries to the Rangers, it was a wonder they won out, but combining Houston’s poor start, a torrid June (20-8), and a crazy-good 36-11 record in one-run games, it was a recipe for Texas to win the division in a walk. 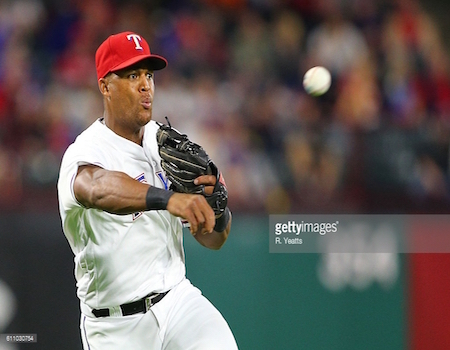 Adrian Beltre had a great 2016, as did the AL West winning Rangers. Analysis: I took my home-state team and ended up in better shape, but the agony of being unable to topple Cleveland at all was a crusher for the Tigers. And, yes, my preseason call that the Indians would be the “best fourth-place team in baseball” still hurts. But, the others all rode the coattails of the defending World Champs and paid the price. Francisco Lindor was a major bright spot for the AL Champion Indians all year long. Analysis: Maybe the toughest divisional call out there. I know we all wrestled with this one, and at some point during our discussion, it’s quite possible we chose different winners. However these were our final choices. Three of us loved the Jays’ offense and pitching enough — and were skittish about Boston’s pitching — to crown Toronto, while Dr. G. made a homer pick that didn’t quite pan out. 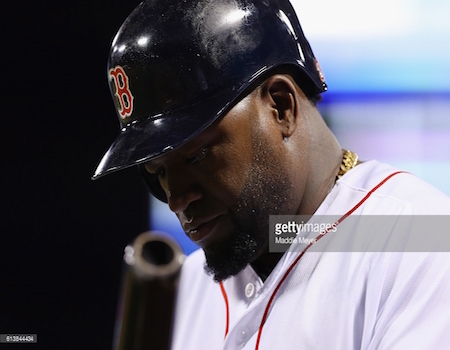 David Ortiz’s final season for the Red Sox was a really, really, REALLY good one. Analysis: Of the six different teams we selected, five of them were in the playoff hunt deep into September, so overall these picks were pretty solid. While our faith in the Jays was pretty good, either as a division winner of wild card, no one gave love to Baltimore, largely on the presence of a super-shaky starting pitching staff. A gut feeling that bore fruit, as the O’s starters put up a 4.72 ERA, good for 13th in the league! The O’s best-in-the-league 3.40 bullpen ERA softened that blow considerably, and helped the O’s make us look silly. None of us picked this. Analysis: Oh, man. Ouch. At least two of us had the Cubbies making the Series. That’s something. And we each had at least one playoff team in our respective pairings, too. For what it’s worth*, I was the only one to get two legit playoff teams in my Fall Classic. *Nothing. It’s worth nothing. I’m just a sad, jobless, hobgoblin trying to make himself feel better. Analysis: Scott nailed this one, as the sophomore Cubbie became the fourth player to pick up an MVP the year after winning Rookie of the Year. He picked up 29 of 30 first-place votes, while blowing away second-place finisher Daniel Murphy in total points, 415 to 245. Rizzo had a strong season for the Cubs too, giving them perhaps the best infield corners in all of baseball. He ended up fourth in the voting, garnering 202 total points. Harper, who won the award in 2015, struggled most of the year to get into a rhythm. Whether it was injuries or just the mental bugaboo of getting pitched around a bunch (leading the league with 20 intentional walks), Bryce hit a solid .243/.373/.441 with 24 homers. Good, but not other-worldly like 2015. 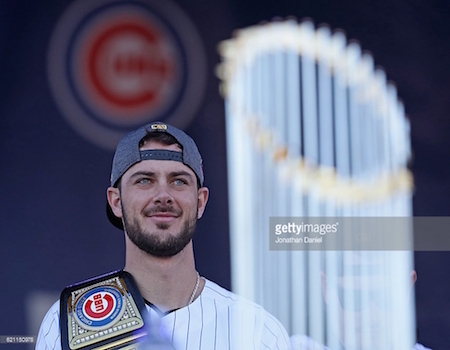 NL MVP Kris Bryant also won a World Series trophy, and what appears to be a WWE Championship belt (Screw Vince!). Analysis: Unlike the AL Cy picks below, all four of us had strong choices here. 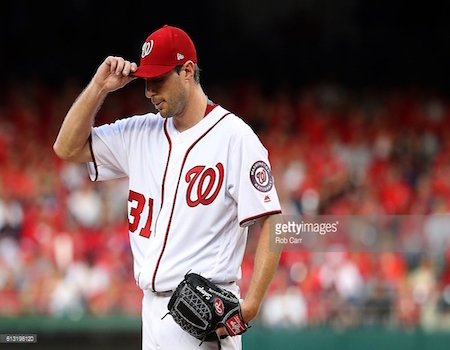 Scherzer led the league in bWAR for pitchers (6.2), wins (20), WHIP (0.968), innings (228.1), and strikeouts (284). Arrieta, last year’s winner, ended up with a solid 3.10 ERA, 18 wins, a 1.084 WHIP, and 190 strikeouts in 197.1 innings. For the Mets, Thor was in the conversation most of the year, posting final totals of 218 strikeouts, a 2.60 ERA, and 5.3 bWAR. deGrom had a solid season, but only made 24 starts due to injury. His overall numbers were pretty decent (7-8, 3.04 ERA, 143 K in 148.0 innings) but hardly award-worthy. With 20 wins and 284 strikeouts, Max Scherzer became just the sixth pitcher to win a Cy Young award in both leagues. He last won with Detroit in 2013. Analysis: The Millville Meteor proved to be the best player in the league again this year and took home the hardware to prove it. 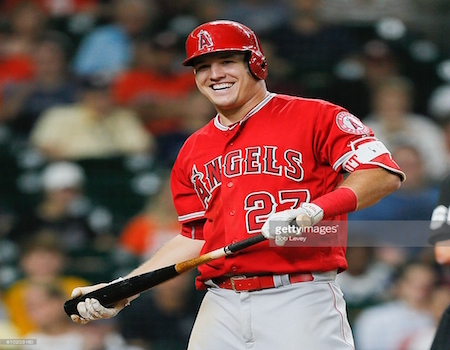 While his team stunk, it really didn’t matter, as Trout was other-worldly. He played a sparkling center field, led the AL in runs (123), walks (116), on-base percentage (.441), and OPS+ (174), all while mashing 29 homers and swiping 30 bases. The Best Baseball Player on the Planet, Ladies and Gentleman. He also rescues kittens and puppies in his down time. Probably. 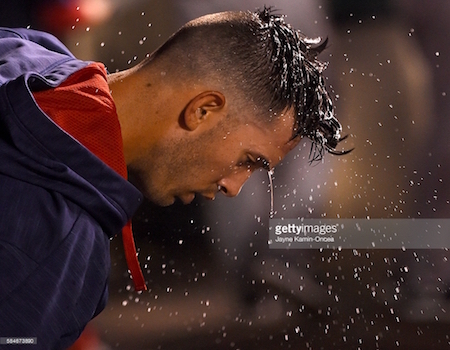 Rick Porcello, your 2016 AL Cy Young winner, part-man, part-mop. Analysis: What the hell were we thinking? Other than Cowboy, Sr., we blew this one big time! Gray went 5-11 with a 5.69 ERA in just 22 starts, while Keuchel followed up his 2015 Cy with a 9-12 record, a 4.55 ERA and just 26 starts. Archer led the majors with 19 losses, but his 4.02 ERA with 233 strikeouts in 201.1 innings was downright excellent next to Kuechel and Gray. Still, none of that trio came close to Sale, the Chicago southpaw who went 17-10 with 233 punchouts in 226.2 innings. In the end, the award went to Boston’s Rick Porcello, who bounced back from a rough 2015 (9-15, 4.92) to run up a 22-4, 3.15 season where he posted career bests in nearly every positive category. For those of you scoring at home, stop it. No one should score a column about nine-month-old predictions. 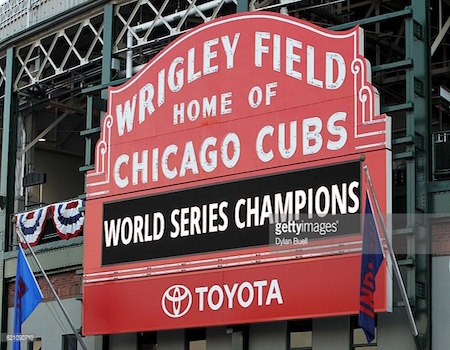 And so the 2016 baseball season in tucked quietly away. It saw remarkable wins and losses, drama after drama, and history was made. As we prepare for the dawn of 2017, with all of the shakiness and uncertainty in our world today, let us rejoice in the fact that baseball is wonderful and comforting and fantastic. With Spring Training just a few months away.